What is really happening when your dog loses his mind. “Reactive” as it relates to dogs, simply describes dogs that “lose their mind” in certain situations. 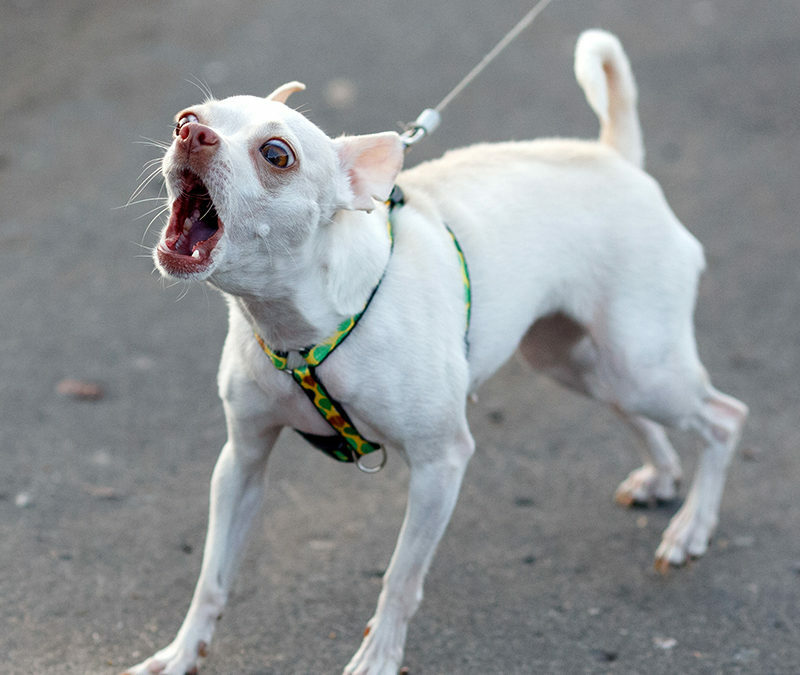 The behaviors associated with reactivity can involve barking, lunging, barking, screaming, barking and pulling. Did I mention barking? But, really, this isn’t your average every day style of barking. It is usually forceful, intense, loud and uncontrollable. It often looks aggressive and scary to all who witness it. So, what is happening when your dog behaves in such a manner? When animals are in a “reactive state” they are responding to a level of arousal that is over their threshold, or over their ability to remain in a cognitive (thinking) state. The medical definition of arousal is “a state of physiological alertness and readiness for action.” Simply put, this means that when an individual is exposed to a high level of sensory stimulation, their brain is flooded with excitatory chemicals such as adrenaline and cortisol. This process is important for survival, because it helps individuals process information that might be critical for staying safe. However, too much arousal, or arousal of an anxious brain can be bad. It has the effect of dulling down the logical, rational part of the brain, while at the same time ramping up the survival response (fight, flight, or freeze). Aroused animals are reactive to something in their environment. And once they go over their threshold, their ability to think is gone. Why are some dogs reactive, while others are not? Some dogs are more prone to hyper-arousal. And it isn’t always a function of the way they were raised. I see it in young puppies, as well as older dogs. In mice, cats, and dogs, there appear to be genetic lines or strains that are more reactive than others, suggesting that reactivity can be hardwired in some individuals. But I also see reactivity in plenty of dogs whose background contributes to their reactivity. A lot of dog park experience, involving high-arousal play. A traumatic experience, such as a dog attack or abuse from a human. A permissive living environment where the dog has not been taught boundaries and not learned that drama doesn’t get them what they want. Inadequate socialization with other dogs. Inadequate supervision at the window and fence barriers – dogs that spend their days barking at dogs and/or people on the other side of the fence or window are practicing high-arousal reactions. Arousal can occur from things that frighten an animal – other dogs, loud noises, the mailman, men with beards, etc. But arousal also occurs when the dog experiences something that produces a positive emotion. This can include things like social play with other dog friendly canines, playing a vigorous game of fetch, or a squirrel sitting on the neighbor’s fence. 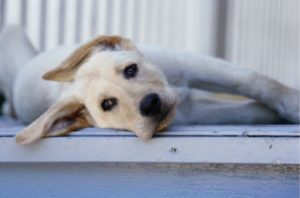 For dogs that fall into the latter category (stimulation accompanied by a positive emotion), sometimes simply seeing another dog (potential playmate) or a new human (potential new friend) causes a dog to become hyper-aroused and unable to think. How can these dogs learn to chill out? For starters, it is important to avoid those difficult situations until you have a plan. If walking in your neighborhood results in multiple “explosions,” stop going for walks in your neighborhood. Neural pathways in the brain strengthen with repeated use, so the more times a behavior is performed, the better the animal gets at it. In other words, every time your dog has a reactive experience, it strengthens the likelihood of it happening again. And remember, once your dog goes over threshold you cannot access his brain. If you cannot access his brain, then no learning can occur. So, all you will be doing is rehearsing the very behavior you wish to avoid! (2) Provide experiences that promote relaxation and calm. A long “sniffing walk” in a quiet corner of a park or along a trail in a natural setting is better than a trek through a busy neighborhood. Feeding your dog his meals in an interactive puzzle toy will encourage him to use more of his brain during meal time. Using a clicker to teach new things to your dog will also encourage more activation of your dog’s thinking brain. If your dog reacts to things outside of the window, block his view to the outside. If highly active and loud children stress your dog out, have a safe quiet place for him to go when the children are playing high energy games. (3) Understand why your dog is reacting. If he is genuinely afraid, then the underlying anxiety must be addressed. And, to be clear, most of the reactivity I deal with is rooted in anxiety. While my experience is not a statistically relevant sample, it is significant. The most effective way to address fear is through behavior modification via desensitization and counter-conditioning. Desensitization is a process where the dog learns to associate the scary thing with something positive, so that eventually the scary thing becomes a neutral or positive thing. Desensitization shifts the dog’s emotional response from negative to positive. Counter-Conditioning is a process whereby the dog is rewarded for exhibiting a behavior that is incompatible with the undesirable one: Looking at you instead of reacting at the other dog, for example. If your dog is aroused due to the possibility of a social interaction, either with a dog or a human, basic training can help. And doing exercises that promote impulse control – specifically, “stay until released.” Once the dog is reliable in low distraction environments, gradually move into more difficult situations. You might start in the far end of the parking lot at your vet clinic…far away from the front doors of the clinic, but close enough that your dog can see the other dogs coming and going. (4) Medication and natural remedies can offer additional support. Flower essences can help! Please see my page about flower essences. Pharmaceutical medication can help! Talk to your veterinarian about the options. You and your dog can get to a better place! Identify and address the underlying cause of your dog’s reactivity. Manage his activities to prevent the arousal that leads to reactivity. Make a plan for working with your dog and give me a call, if you need some specialized help! Yes! And, if you think about it, this concept is applicable to we humans too. Repetition creates strong pathways in our brain. AND when we get stressed and go over our threshold, our brains tend to shut down too!